It took awhile to pick back up with book two in The Madman's Daughter series. While book one was quite entertaining, the end of it did not necessarily leave me dying to find out what happened next. Book one seemed to drag, just a bit, and the ending made me just the tiniest bit irritated. Alas, I finally picked up book two, two months later, and I'm so glad I did! Her Dark Curiosity picks up several months after Juliet is abruptly pushed off of the Island (literally) after she has made it back to London. Juliet is now living with the Professor, the man who apparently turned her father in to the police once he began his experiments. Of course, she isn't entirely content with the rich, fluffy life the Professor gives her and, of course, she can't stop thinking about Montgomery - or Edward Prince. This book really gave me a chance to get to know some of the characters a lot better than The Madman's Daughter did. Juliet is just as dark and twisted in book two as she was in the first, although she spends much of the book trying to overcome it. I was really surprised by some of the things that happened, especially some of Juliet's decisions, but her imperfections are really what make me love her as a character. I felt like I was inside her mind at times. Megan Shepherd has done a fantastic job with Juliet! I also loved getting to know Edward even better than I already did. He is such a fascinating character - especially after everything that was revealed towards the end of book one! The one absolutely useless character in Her Dark Curiosity is Lucy, who we get to know a little better since Juliet is back in good social standing and thus good enough to be around her. She got on my nerves so many times throughout this book and one idiot move she made near the end sealed the deal for me - she's useless. Other than her, I loved most of the characters including the new ones. The good guys weren't entirely good and the bad guys were deliciously evil! The love triangle continued throughout the book, but it was done in a way that really did work for me and was mostly believable. Megan Shepherd continues her fantastic world building with Her Dark Curiosity, although this one is set entirely in London. I felt like I could see the city and almost see Juliet moving through it. Her attic was perfectly dark and dingy in my mind and the Island-like botanical gardens seemed spectacular. The entirety of London took on a creepy air with the exception of Lucy's house, which always seemed very Downton Abby-esque. The story that continued in book two really was better than that of book one, which was really surprising to me since I've always been a huge fan of The Island of Doctor Moreau. I'm pretty impartial to the Jekyll/Hyde story, but I am totally in love with the way it was used here! I loved that everything was wrapped up in a big conspiracy (What can I say? I'm a sucker for conspiracies) and I loved that the list of people involved was shocking and seemingly endless. All of it made everything seem more urgent and exciting! 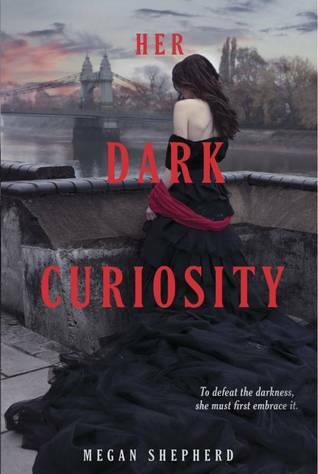 Her Dark Curiosity definitely kicked the series up a notch in my book! I would have grabbed book three immediately after finishing except I already had something else on the agenda. I definitely have plans to read A Cold Legacy as soon as possible! I would definitely recommend picking this one up even if you weren't totally in love with The Madman's Daughter. This one is awesome!